The responses to this story about the Tories’ “blatantly unfair” an arbitrary increases in the state pension age have shown that selfishness is still king of the United Kingdom. It’s not very long since the pension age was 65 for men and 60 for women – and nobody objected very much. 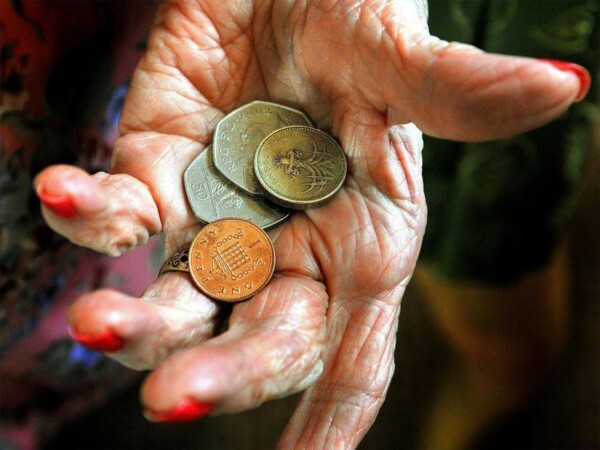 Now, despite the fact that the National Insurance Fund is many billions of pounds in surplus, the Tories want to force you to retire later in life – increasing the retirement age by three years for men and a massive eight years for women, by 2037. There is no reason for doing this, other than trying to ensure that some people never reach retirement. AN MP in Oldham says it is ‘blatantly unfair’ that over tens of thousands of people in her constituency face an extension to their retirement age. Shadow work and pensions secretary Debbie Abrahams, MP for Oldham East and Saddleworth, said 61,187 people could have their retirement age raised from 66 to 68, from 2037. The government’s proposals will see 36.9 million people having to work longer. Wow. People aren’t living longer. Since the Tories returned to office in 2010, life expectancy has been dropping. As for supporting the rich – it’s more accurate to say that they aren’t supporting the rest of us as much as they should, having received multiple tax breaks from the Conservatives. This fool doesn’t understand how Parliament works. Labour was in Opposition when the retirement age was raised to 66 and could do nothing about it. Well, somebody does. If any “unskilled poverty-stricken migrants” have come to the UK, it is because the Conservatives did not exercise the controls on migration that were available under EU rules. Yes, there are such rules. Also, Labour never wrecked the economy – that was done by greedy bankers, as Labour has made clear over the past few years. Under Theresa May, the rich are paying less than they should, having benefited from tax break upon tax break. DLA has been axed. It is much more difficult to claim the new benefit, PIP. Just wait until this buffoon tries it. Jobseekers of any age have to sign an agreement to seek work and accept any that is offered to them. Failure to comply leads to sanctions, meaning they lose all their benefit for a period of time that increases up to three years. If this person tries to sign on in the belief that they’ll get an easy ride, they will end up in the gutter or the morgue. That is Tory Britain for you. And these commenters, quite clearly Tories themselves, need to wake up and understand the realities of the government they support. An obvious consequence of this policy is to block access to employment for the young. How perverse to force people to work longer and deny opportunities to the their grandchildren, who would bring fresh energy and enthusiasm. Almost as if the aim is to cause maximum inter-generational misery! Excellent piece Mike. The Tories are digging their own political grave. Even more young people will vote Labour at the next election. The fact is that we do not even have to raise tax to spend in the economy, or pay for public expenditure as all money is created out of thin air. The private banks create all money bar 3% (which is printed or minted by the Bank of England) each time they make a loan, money is then destroyed as the money is paid back. In reality if the government which owns the Bank of England can issue money wherever and whenever it chooses. The fact they choose not to is a purely political decision. These two separate articles explain in detail how money is created out of thin air, most politicians now understand this, although some also lie to us when they say where is the magic money tree? When the Tories want to bribe Irish politicians, the magic money tree suddenly appears, when we ask for money for pensions or the NHS, suddenly the country is broke. There are a lot of paid and unpaid troll groups on the right. Only this week they have tried to destroy a woman I know who stood in a local election, for Labour, and has publicly supported Labour policy. It’s been vile and relentless. It does make any individual feel like they are up against a raging tide of right wing opinion, but in reality it is a small group of ultra vile individuals. If the “alt-right” were not quite so happy being vile, I might pity them, because everyone I have met who has been sucked into that particular cesspit has been lonely, sad, often obsessing about these “facts”, less than intelligent, and whose life is being ruined by being eaten from the inside out by their own hatred and fear. It only takes a few though, to make life very difficult for many. Few of this generation will, I suspect, have experience of the way unscrupulous governments tap into the hate of many minorities to achieve their goals, but many pensioners derive from this genesis. We must all have such a neighbor living next door, who from their perspective have a single over riding motive. But egocentric behavior is not the preserve of the amoral, it is within us all. Making a decision resulting in depriving the needy has many facets, often based on altruism within their familial circle. I would challenge any poll to find other than the burgeoning retiring generation being consensualy used in this way. So if the shame lies anywhere, we should first examine ourselves. At one time I might have believed these comments came from genuine independent Oldham readers, but that was before I took an interest in politics. Today I see a small group of Tory party activists scouring local newspapers, looking for articles by or about Labour MPs, where they can post negative comments. What so many of these tory-voting idiots don’t seem to understand is that, ever since Thatcher came to power and tore up the rule book, she encouraged everyone to just think of themselves – a real ‘Me Me’ way of thinking – and so, even when Labour came to power, it was a right-wing party, who may as well have called themselves Tory-Light! Now, with yet another tory government, who look at the poor and needy with utter scorn, we live in a dog-eat-dog world here in the UK, and most of those who made such awful comments, have probably known nothing but a selfish way of thinking ever since they were born, and wouldn’t recognise a truly socialist man when they see one. But do so many more people have to suffer and die, once again, before the UK wakes up to what it’s become?